Mont Saint-Michel is one of the most visited sites in France, for good reason. If you are able, visit off-season, early in the morning, or in the evening when the crowds are fewer. But sometimes it’s just not worth battling the crowds. Visiting Mont Saint-Michel is also a bit more of a commitment these days, as you are required to park in the new lot 2.5 km from the town and walk or take a shuttle bus. 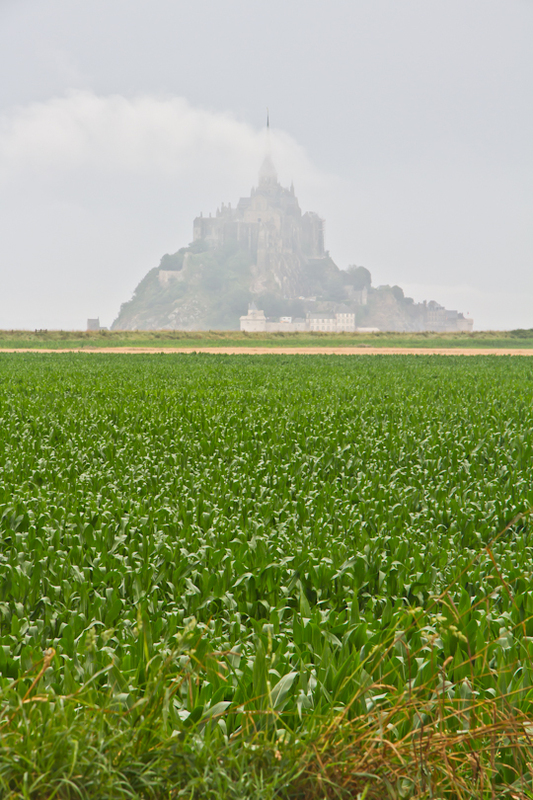 This summer, we were driving from the Normandy beaches to Saint-Malo and would have been tempted to stop off at Mont Saint-Michel, but it was pouring rain when we were approaching the parking lot. It was hard to get a good glimpse of the Mont from the parking lot area (and impossible to pull over anywhere). Instead, we went past the parking lot, heading south on the D976. ABout 800m south of the bend in the road at the parking lot, we took a right onto Rue d’Asteriac by Hotel Le Beauvoir, then another right after the bridge. We then wound our way north again until the road ended, and found ourselves all alone with a spectacular view of Mont Saint-Michel. We were not able to visit the town, but we were able to get a sense of the geography and enjoy this impressive site with zero crowds. Not bad, huh?